El Cazadero combina la arquitectura histórica y fechas artísticas hasta con elegante estilo y gracia. Paso por la puerta ... ser sorprendido por una gran biblioteca incorporada (con escalera!) rodeado de originales:. murales, pisos de pasta, puertas artesanales y 18 pies techos. La biblioteca es un lugar perfecto para la lectura en silencio, salir o ver películas. El primer nivel cuenta con un plan de piso abierto con cocina, comedor y sala de estar se abren a un patio cubierto con vistas a la piscina y jardín. El salón principal contiene una escalera flotante que lleva al dormitorio en suite con su propio balcón privado. Esta hermosa casa está llena de arte original y muebles diseñados específicamente para ello. El jardín cuenta con paredes antiguas de piedra que rodean una hermosa piscina, hermosas flores y árboles frutales maduros. El Cazadero está situado en el Centro histórico, a 15 minutos a pie (o 5 minutos en coche) a la Plaza Grande. Estamos cerca de restaurantes, tiendas, 18o c. iglesias y museos. Relájese en un paseo cafe lado, escuchar música, o ver el baile popular - echa un vistazo a el sabor colonial de Mérida. Venga a explorar las muchas maravillas de Yucatán ... esperamos contar con usted. We appreciated this home for its intrinsic beauty and location in a quiet neighborhood south of Centro. The original murals set the tone the minute you step in to this sensitively remodeled colonial home. The home feels large for a one bedroom and the pool was refreshing. Uber was a inexpensive way to get where we needed in town and on recommendation from the owner, renting a car in Centro was less expensive than at the airport for farther doing excursions. Deborah is well connected in town and provided wonderful recommendations. The pics don't lie and it's more beautiful in person..quiet neighborhood, easy and inexpensive to use uber..PERFECT location to explore the city and surrounding attractions..spent 7 days, need 10..THANK YOU DEBORAH OUR FINE HOST!! We just returned from Merida and had a great two weeks at El Cazadero. The house is beautifully furnished in the style of colonial Merida, with so much attention to details, yet is modern where you want modern, like in the bathrooms! The showers are great, there is plenty of hot water, excellent fans and air conditioning, if you need it. Although we didn't consider the open staircase a problem, it could be a limitation for some people. Spending a lazy afternoon on the hammock on the upstairs porch or an evening on the covered porch on the first level, overlooking a beautiful, lighted and walled backyard are great ways to enjoy the ambiance of the home. We loved the San Sabstian neighborhood. Initially we thought it was a little far from the Plaza Grande, but soon appreciated all that the neoghbroorhood had to offer-- the local church and park, where people gathered in the evenings, the sports area-watching girls softball, or kids playing soccer and basketball, exercise classes , or practicing on their drums. There are several small and local outdoor eating places, where we had breakfast, lunch, or dinner! Also in the area around Calle 75 and between 66-70, there's a bakery, a small grocery store, an ice cream place and a small pizza place, with good wood oven, thin crust pizza. We did not have a car, but found it was very easy to hail a taxi, anywhere alone Calle 77. We felt completely safe in the neighborhood (and the city, in general), walking at any time. Deborah and Eduoardo were extremely helpful and available. They couldn't have made our stay better! Who could ask for more- a beautiful home, great art, pool, privacy with a good location.The bed was comfortable and we felt very safe. We would definitely go back. El Cazadero was delightful. I was enchanted by the murals immediately. this home was both comfortable and inviting. It was well appointed and all the amenities were at hand. Location being of up most importance, this property was perfect. I would recommend this home to my friends (in fact I am going to). I will be returning next spring and hope this property will be available . 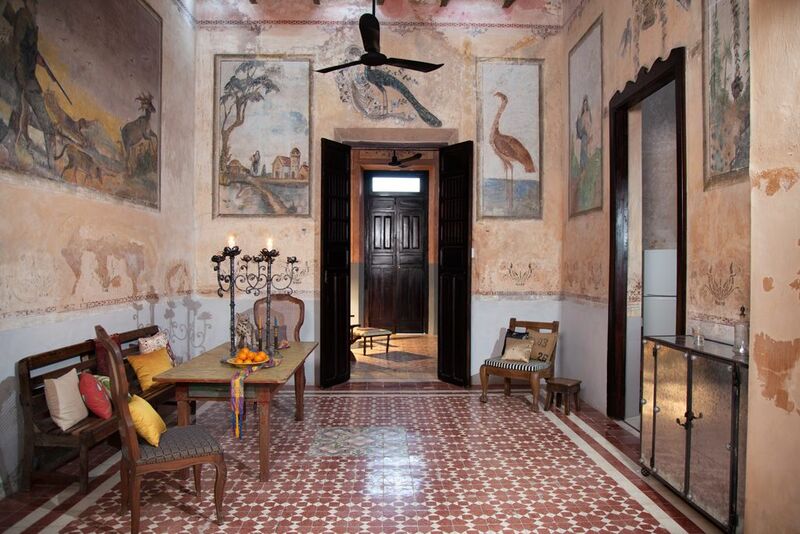 We have stayed in many houses in Merida over the years, but this one is hands down the most gorgeous. We had high hopes based on the photos, but still could not believe our good fortune when we walked in the front door. Every space (both indoors and out) is perfect! The house is also in the perfect location for touring Centro---but, truth be told, the highlight of our vacation was the time spent at El Cazadero. We cannot wait to return! Estamos ubicados en el centro histórico de Mérida, cerca de catedrales, restaurantes, tiendas y museos. Hay música y baile en el principal semanario plaza. Somos un paseo en coche / bus 30 minutos de la playa. Electricity usage is to be paid by guest.